آنالیز تصاویر چندزمانه سنجش‌از دور، تکنیک کارآمدی برای شناسایی تغییرات کاربری و پوشش اراضی در مناطق شهری می‌باشد. جدا از تکنیک بکار رفته برای شناسایی تغییرات،فضای ویژگی تأثیر بسیار زیادی در صحت نتایج دارد. حصول نتایج رضایت‌بخش در شناسایی تغییرات مناطق شهری، مستلزم بکارگیری ویژگی‏ های طیفی و مکانی (بافت) بهینه می‏ باشد. اگرچه جستجوی سراسری تنها تضمین دست‌یابی به مجموعه ویژگی‌های بهینه است، ولی در عمل فرآیندی بسیار زمانبر و غیرعملی است. در تکنیک‌های کاهش‌بعد همچون تکنیکPCA تنها استقلال آماری داده‌ها برای رسیدن به مؤلفه‌هایی جدید با وابستگی کمتر مدنظر بوده و بهبود صحت شناسایی تغییرات بطور مستقیم دنبال نمی‌شود. 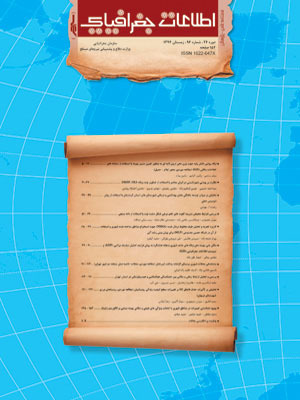 تعیین حدآستانه مناسب برای انتخاب ویژگی‌های بهینه در تکنیک تفکیک‌پذیری‌آماری (SAA) با فاصله JM نیز عملاً از کارایی این تکنیک می‌کاهد. تمرکز اصلی مقاله حاضر، انتخاب ویژگی‌های طیفی و بافت بهینه با الگوریتم ژنتیک و طبقه‌بندی‌کننده بیزین می‌باشد. جهت بررسی کارآیی تکنیک پیشنهادی، تغییرات شهر جدید سهند (شمال‌غرب ایران) با بکارگیری تصاویر سنجنده‌های IRS-P6 و Geo-Eye1اخذ شده در 14 جولای 2006 و 1 سپتامبر 2013 مورد بررسی قرار گرفت.تمامی تکنیک‌های مذکور در محیط برنامه‌نویسی MATLABR2013aپیاده‌سازی شدند.نتایج حاصل از این تحقیق نشان داد ویژگی‌های بافت می‌تواند به عنوان منبع اطلاعاتی مکمل، سبب بهبود نتایج شناسایی تغییرات در مناطق شهری شود. انتخاب ویژگی یک فرآیند تأثیرگذار در شناسایی تغییرات مبتنی بر ویژگی‌های طیفی و بافت می‌باشد. هریک از تکنیک‌های انتخاب ویژگی، محدودیت‌ها و مزایای خاص خودشان را داشته ولی در کل بهبود صحت شناسایی تغییرات را بدنبال دارند. مقایسه کارآیی تکنیک‌های انتخاب ویژگی نشان داد، تکنیک پیشنهادی در مقایسه با دو تکنیک متداولPCA و SAA (که نتایج مشابهی داشتند) از کارآیی و صحت بالاتری برخوردار است.با بکارگیری روش پیشنهادی، ضریب کاپا و صحت کلی نقشه تغییرات به ترتیب از 66/53% به 49/88% و از 94/58% به 39/90%،(در مقایسه با بکارگیری باندهای اصلی تصاویر)،افزایش یافت. Analyzing multi-temporal remotelysensed images is an effective technique for detecting land useand land cover changes in urban areas. Apart from thetechnique used to detect the changes, the features space has an enormous impact on the accuracy of the results. Achieving satisfactory results in detecting changes inurban areasrequires the use of optimal spectral and spatial features (texture). Although global search is the only guarantees of achieving the optimal set of features, but it is a very timely and impractical process in practice. Data reduction techniquessuch as PCA considers the independence of the data tofind a smaller set of variables with less redundancy withoutintending to improve the CD accuracy. Difficulty in setting thebest threshold for JM distance in Separability Analysis Algorithm (SAA)reduces its efficiency. The main purpose of this paper is to select the optimaltextural and spectral features to enhance the CD accuracy usinggenetic algorithms (GA) and Bayesian classiﬁer. To investigate the effectivenessof the proposed tecknique, a case study using IRS-P6and GeoEye1 satellite imagery taken from Sahand New Town (Northwest ofIran on July 15, 2006, andSeptember 1, 2013) was performed. All of the aforementioned methods of feature selection (PCA, SAA and proposed GA-based method) were implemented in MATLABR2013a. The results show that, textural features provides a complementary sourceof data for CD in urban areas. The results show thatfeature selection is an effective process fordetecting changes basedon textural and spectral features. Each of the techniques for selecting features has its own limitations and advantages, but in general, improve the CD accuracy. The proposed GA-based feature selectionapproach was found to be relatively effective when compared withPCA and SSA approaches. Overall accuracy and Kappa coefficient ofCD were increased from 53.66% to 88.49% and 58.94% to90.39%respectivelyusing proposed methods compared tothe use of spectral information. 1- Agüera, F., Aguilar, Fernando J, Aguilar, Manuel A. (2008). Using texture analysis to improve per-pixel classification of very high resolution images for mapping plastic greenhouses. ISPRS Journal of Photogrammetry and Remote Sensing, 63(6), 635-546. 2- Brumby, S. P., Theiler, J. P., Perkins, S. J., Harvey, N. R., Szymanski, J. J., Bloch, J. J., & Mitchell, M. (1999). Investigation of image feature extraction by a genetic algorithm. Paper presented at the SPIE’s International Symposium on Optical Science, Engineering, and Instrumentation. 3- Chen, X., Chen, J., Shi, Y., & Yamaguchi, Y. (2012). An automated approach for updating land cover maps based on integrated change detection and classification methods. ISPRS Journal of Photogrammetry and Remote Sensing, 71, 86-95. 4- Erener, A., Şebnem Düzgün, H. (2009). A methodology for land use change detection of high resolution pan images based on texture analysis. Italian Journal of Remote Sensing, 41(2), 47-59. 5- Goldberg, D. E., & Holland, J. H. (1988). Genetic algorithms and machine learning. Machine learning (2) 3, 95-99. 6- Hu, Q., Wu, W., Xia, T., Yu, Q., Yang, P., Li, Z., & Song, Q. (2013). Exploring the use of Google Earth imagery and object-based methods in land use/cover mapping. Remote Sensing, 5(11), 6026-6042. 7- Huss, M., Stockli, R., Kappenberger, G., & Blatter, H. (2008). Temporal and spatial changes of Laika Glacier, Canadian Arctic, since 1959, inferred from satellite remote sensing and mass-balance modelling. Journal of Glaciology, 54(188), 857-866. 8- Hussain, M., Chen,D., Cheng, A., Wei, H., Stanley, D. (2013). Change detection from remotely sensed images: From pixel-based to object-based approaches. ISPRS Journal of Photogrammetry and Remote Sensing, 80, 91-106. 9- Imhoff, M. L., Zhang, P., Wolfe, R. E., &Bounoua, L. (2010). Remote sensing of the urban heat island effect across biomes in the continental USA. Remote Sensing of Environment, 114(3), 504-513. 10- Jensen, J. R. (2004). Introductory digital image processing: a remote sensing perspective: Prentice-Hall Inc.
11- Li, Z., Chen, J., & Baltsavias, E. . (2008) Advances in photogrammetry, remote sensing and spatial information sciences: 2008 ISPRS congress book (Vol. 7): CRC Press. 12- Mhangara, P &., Odindi, J. (2013). Potential of texture-based classification in urban landscapes using multispectral aerial photos. South African Journal of Science, 109 (4-3) 1-8. 13- Myint, S. W., Lam, N. S.-N &., Tyler, J. M. (2004). Wavelets for urban spatial feature discrimination. Photogrammetric Engineering & Remote Sensing, 70(7), 803-812. 14- Radke, R. J., Andra, S., Al-Kofahi, O., & Roysam, B. (2005). Image change detection algorithms: a systematic survey. Image Processing, IEEE Transactions on, 14(3), 294-307. 15- Richter, R., Kellenberger, T., & Kaufmann, H. (2009). Comparison of topographic correction methods. Remote Sensing, 1(3), 184-196. 16- Sallaba, F. (2009). Potential of a Post-Classification Change Detection Analysis to Identify Land Use and Land Cover Changes. A Case Study in Northern Greece. 17- Tassetti, A. N., Malinverni, E., & Hahn, M. (2010). Texture analysis to improve supervised classification in IKONOS imagery: na. 18- Taubenböcka, H., Wegmannb, M., Rotha, A., Schmidta, M., & Decha, S. (2009). Urbanization in India -Spatiotemporal analysis using remote sensing data. Computers, Environment and Urban Systems, 33(3), 179-188. 19- Tuceryan, M., & Jain, A. K. (1993). Texture analysis. Handbook of pattern recognition and computer vision, 276. 20- Xie, M., & Fu, M. (2011). The temporal dynamics of urban heat islands derived from thermal remote sensing data by local indicator of spatial association in Shenzhen, China. Paper presented at the International Conference on Photonics and Image in Agricultural Engineering (PIAGENG 2010).